Happy New Year everyone! We would like to start the new year with giving you a bit of an update on what we have been up to since our Summer Excavation Season Ended in August 2017. Well as anyone who has worked on an archaeological site knows, archaeology is but a small bit of digging and a lot of paper work! Therefore, we have spent the past 4 months organizing, archiving and digitizing all of the material collected in 2017. This includes report writing, preparing material for specialist analysis, cleaning, counting and boxing. See some upstanding remains of Medieval Dominican Friaries from which we can compare our ownBlackfriary. Have a look at an example of a heritage site being used as a community space and more importantly turned into a medieval community garden which is one of our ongoing ambitions forBlackfriary. FIrst task of the day; Fin and Ian figure out how to fit 2m ranging rods into the car! We began with a visit to Portumna Friary in County Galway. This site began as a chapel of the Cistercians before the site was given to the Dominican Order sometime before 1414. Most of the surviving remains are 15th Century (see photo below) including the Cloister and parts of the Church. 15th C East Window of Church at Portumna. Was there stained glass in this window like the pieces we have found at Blackfriary? 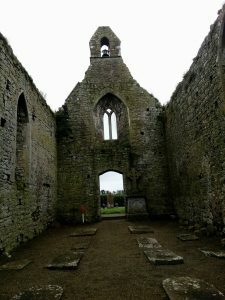 Next on the list of friaries was Lorrha Dominican friary in North Tipperary, established in 1269 by the Earl of Ulster, Walter De Burgo. Unfortunately, we did not get into the Chancel as it is currently under restoration. The church here is quite impressive at 46 Metres in length and 8m wide. This is close to the size of Blackfriary which we estimate to be c.50m in length. The final stop of the day was Roscommon Friary. This is a fantastic site and we have added it to our list of fieldtrips for students. 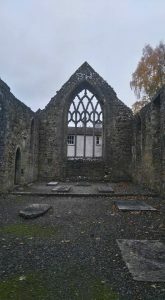 This Dominican Friary was found in 1253 by Felim O Connor the King of Connaught. The standing remains today comprise of the church in ruins. We were able to measure the dimensions of the Nave and side aisle to compare to our own site. The highlight of this site is the tomb of Felim O’Connor containing a beautifully carved 13th C effigy on top and a 15th c frontal of carved armed men. 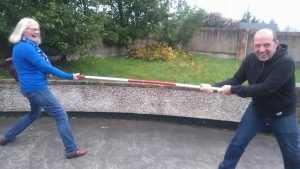 You can find out more about this site at the Monastic Ireland website (http://www.monastic.ie/history/roscommon-dominican-friary/) where the Discovery Program have made an amazing reconstruction video. 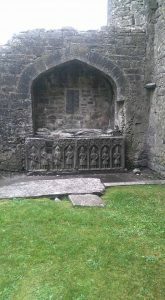 Tomb of Felim O’Connor at Roscommon. In between Portumna and Loorha Friaries, we managed to fit in a quick visit to Portumna Castle. This castle has gone through a lot of reconstruction and conservation work. More interestingly for us, there is a re-constructed post-medieval (17th Century) garden which was the original kitchen garden for the castle.. This garden was also restored by the Office of Public Works who manage and conserved the castle, and is a beautiful and tranquil space to wander around. 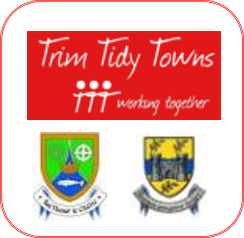 At Blackfriary we have our own community garden space which we would like to develop further, so Portumna has given us some great ideas! We also had lunch at a lovely community centre in Lorrha. This hall has been altered to serve as a café, shop and tourist information centre selling everything from maps and books to local hand-crafted gifts and even local pork produce! 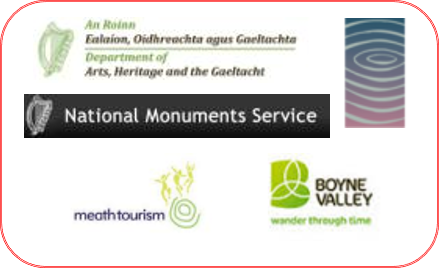 You can check out this little hidden gem at http://www.lorrhadorrha.ie/. 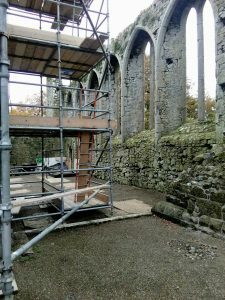 This was a great fieldtrip which we thoroughly enjoyed but more importantly we have a new understanding about how the size of Black friary can potentially tell us how important Blackfriary was in the middle ages and its status among the Dominican order. Visiting the gardens at Portumna and visitor centre at Lorrha illustrates what can be done with a space by a community group to improve it for locals and tourists alike. Time to start planning! !